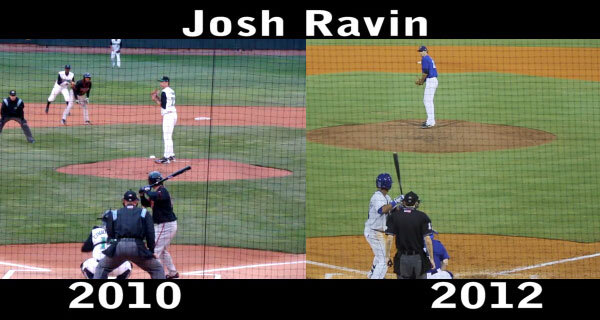 Josh Ravin has always been an intriguing prospect for me. He has a big time arm and has shown plus to plus-plus velocity for years now. 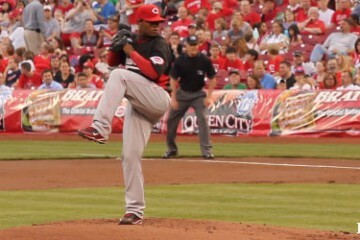 Despite being drafted in 2006 out of high school, the Reds gave him his first taste of the bullpen in 2012. He initially struggled with the role after beginning the year on the disabled list before finally getting into the regular season in late July after three brief appearances in June. The Reds sent him out to Arizona for the AFL and he performed quite well over 12.1 innings (including the championship game). 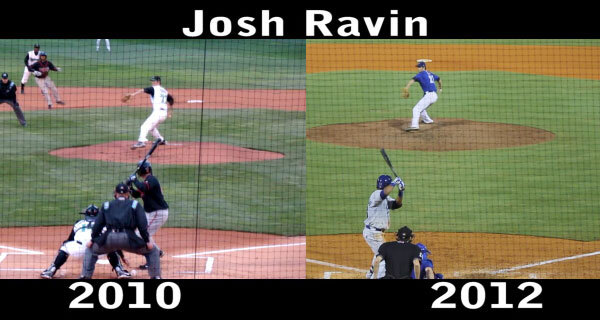 After the AFL stint the Reds added Ravin to the 40-man roster. While there is a transition from starter to reliever, there have been quite a few changes to his mechanics as well over the years. 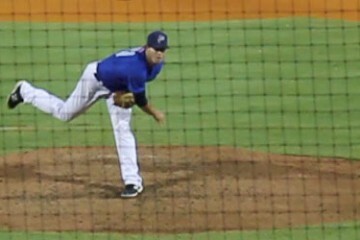 I went back to April 2010 for video of the right hander starting for Dayton and compared it with video from August of 2012 as a reliever with Pensacola. In this first frame it shows the high point in which Ravin brings his glove as he comes set in the stretch. This is quite a difference in his set up. In this frame it the highest point in which Ravin brings his front leg. In 2010 not only is his leg coming up higher, but his front leg is closer to a 45° angle in 2010, where as it is closer to a 90° angle in 2012. Going back to the first image, his hands are lower in 2012 than they were in 2010 as well. 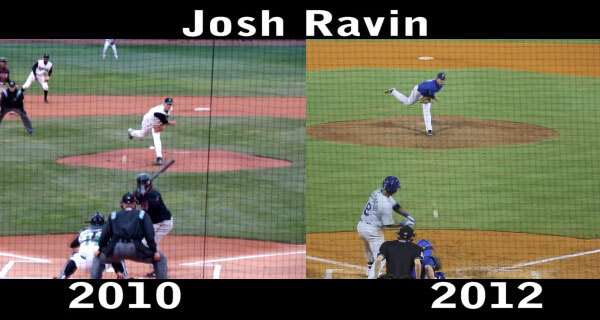 This kind of goes back to what we have seen before, but Ravin is keeping his glove hand lower in 2012 than in 2010 and it is also a little bit closer to his body than it was in 2010. In this last frame we see the high point in which is back foot rises in his follow through. In 2010 his back leg and and foot stayed much lower than it did in 2012. Another thing to look at is his pitching arm. It isn’t exactly easy to see here, but his pitching arm follows through closer to his body in 2012, where in 2010 it came across his body a little bit more and sort of came to a stop before wrapping around his body. In 2012 his arm wraps around his body as he follows through a little bit more. What stands out is how much quieter his delivery has become, especially the lack of head movement. Hands starting lower in the stretch. More compact. Not as tall has become a little more drop and drive to harness his control. MLBTradeRumors report Reds sign Cesar Izturis. The Reds signed Cesar Izturis. Maybe that’s the back up SS we have been searching for.